Select how you wish to have strokes applied on the scorecard. To find this form select Handicap Calculation Parameters from the Setup menu and click on OK on the first screen. Recommended if you are awarding points for Individual Competition...Player versus Player. The lower handicap player receives no strokes, the higher handicap player receives strokes based on the difference in handicaps (High Handicap - Low Handicap = Handicap Difference). Note: If you also award points for Stableford Competition, a golfer’s full handicap will be applied to the scorecard to determine Stableford points. Example: Bob’s handicap is 8, Ted’s handicap is 9. Bob has the low handicap and receives no strokes. Ted receives 1 stroke (9 - 8 = 1) on the first handicap hole. Recommended if you are awarding points for Best Ball or Ranking Competition. The lower handicap player receives no strokes, the higher handicap players receive strokes based on the difference in handicaps. Example: Bob’s handicap is 8, Ted’s is 9, Sam’s is 10, Fred’s is 11. Bob has the low handicap and receives no strokes. Ted receives 1 stroke (9 - 8 = 1) on the first handicap hole. Sam receives 2 strokes (10 - 8 = 2) on the first two handicap holes. Fred receives 3 strokes (11 -8 = 3) on the first three handicap holes. Recommended if you are awarding points for Stableford Competition. 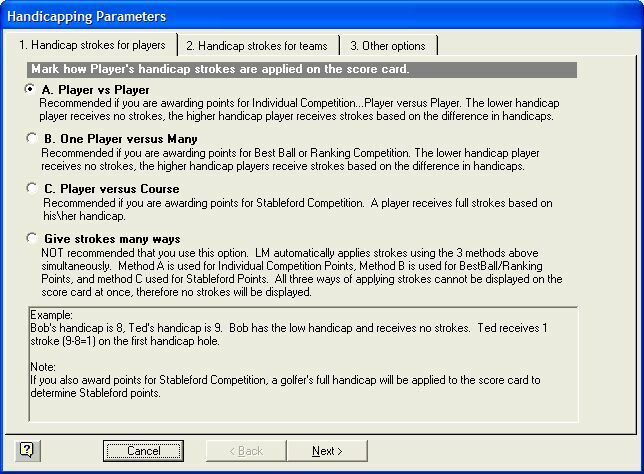 A player receives full strokes based on his\her handicap. Example: Bob’s handicap is 8. Bob receives 8 strokes on the first eight handicap holes. NOT recommended that you use this option. 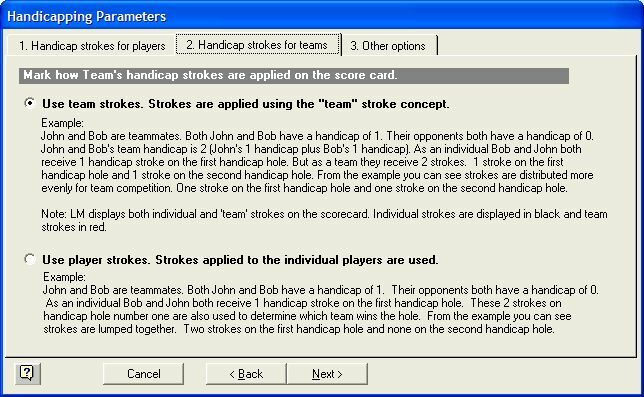 League Manager automatically applies strokes using the 3 methods above simultaneously. Method A is used for Individual Competition Points, Method B is used for BestBall/Ranking Points, and method C used for Stableford Points. All three ways of applying strokes cannot be displayed on the scorecard at once, therefore no strokes will be displayed. If you are awarding points for a "Team Aggregate" competition. Indicate how your wish strokes to be applied for this type of competition. Some leagues limit the number of strokes a player is allowed to receive on par 3’s. If your league has such a restriction, mark the option “Restrict Strokes Applied on Par 3s”, and type the number of strokes a player is allowed to receive. Example: John Doe is to receive seven strokes. No strokes are allowed on par 3s. How would strokes be applied? An ‘*’ indicates one stroke given on a hole. Note: Any unused strokes are carried forward to the next handicap hole. Some leagues limit the number of strokes a player can receive when playing against another player. If you have no limit, set the option to “No max”. Example: You set the maximum strokes to 9. John has a handicap of 15 and plays Bob a golfer with a 2 handicap. John is entitled to 13 strokes (15-2=13). However, because of the limitation he is only allowed 9 strokes.